Muns Vineyard brushes the sky on a ridge above Monterey Bay at 2600 feet. This is the highest Pinot Noir vineyard in the Santa Cruz Mountains, a prime growing region for this luscious winegrape. We enjoy the coastal climate of the mountains, with fog lapping at our feet in the summer. The cool coastal breeze that blows off the fog and sunlight are perfect for growing premium Pinot Noir. 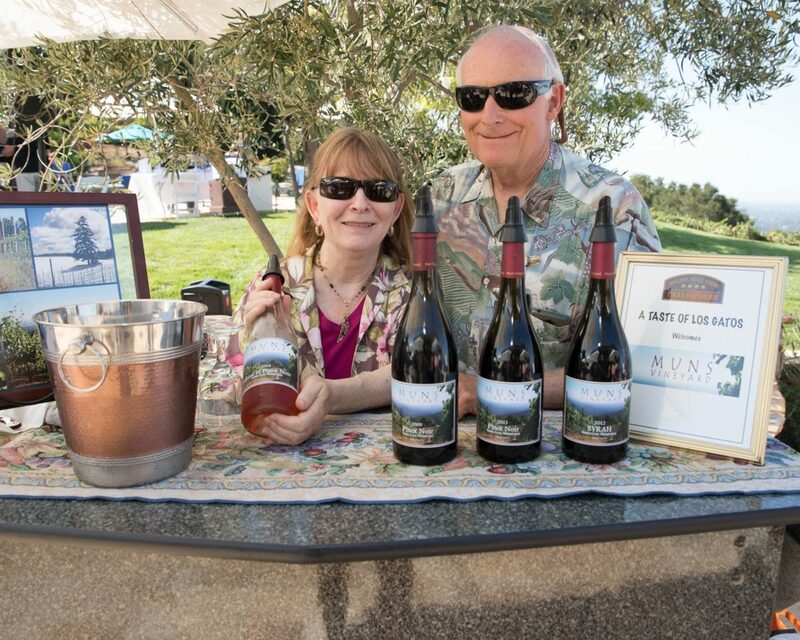 Moderate days and cool nights, along with diligent personal attention in our 13-acre owner-operated vineyard, produces fruit with rich and complex flavors. We have blended Dijon clones 114, 115, 667 and 777 to provide a complex and well-balanced wine. The best way to bring our wines home is to order directly from us. This way you can get the vintages you want and you can benefit with a 15% discount on 6 bottles; 25% on a case (and you can mix your wine selection). We deliver locally at no charge (with a 3 bottle min. order). We also ship. For a list of our wines, see the Wines page here. To order, see our Order page here. For even better discounts, see our Wine Club page here. See the Where to Purchase page here for a list of wine shops, wine bars and restaurants where you can enjoy our wines. Many of the wine bars sell bottles to go. What’s Happening in the Vineyard: Spring is Here! Budbreak with Santa Cruz below in the distance. Pinot enjoys a Spring day in the vineyard. Glowing in the morning sunlight. The aisles are mowed and hoed under each vine. Cloud bank over Mount Umunhum. Watch Ed mowing on our YouTube channel. A foggy morning in the vineyard. A very clear day view of Santa Cruz. Bloom in the Pinot Noir. Bloom in the Pinot Noir, close up. See more on our Vineyard page here. See our YouTube Channel here for what’s happening in the vineyard – it’s like you are there! Get up close and personal with the crawler and flail mower here . We are open 11-3:00 on these scheduled dates. Please make a reservation to mary@munsvineyard.com. Space is limited. See our Events page for more information. See our Events page for more events and information. See Muns Vineyard videos on YouTube here: Harvest, Netting, Pruning, Aerial drone view, Mowing, more . Ed moving a half-ton bin full of Pinot Noir. The crew picking on the hill at dawn. We start at 4am in the cool of the early morning. Dawn, with Mount Thayer and Mount Umunhum in the background. The bin is filling up with Pinot clusters. Luscious, juicy Pinot Noir clusters! Just after dawn; the coastal fog over the Bay and Monterey in the distance. The view picking at the top of the Big Hill. Proudly showing off the big beautiful clusters of Pinot Noir. Misty morning dawn and this bin is filling up. Another early morning start. Luis. Morning dew glistens on the clusters during a misty night. Morning dew on the clusters sparkles under the headlamps. Early morning and the vineyard glows in its Autumn colors. Martin picking in the golden light. Big beautiful clusters on the last day picking Pinot. Picking Syrah with the view across the mountains to Bonny Doon. The syrah in a bed of Autumn foliage. The 2018 vintage is going to be fantastic! It is without doubt the best crop load we’ve ever had (since 2003), and the fruit quality and flavors are excellent. We picked 50 tons of Pinot Noir over seven days between Sept. 17 and Oct. 15; and picked 5.5 tons of Syrah on Oct. 18. This is a lot to ask of the vineyard, but the vineyard is healthy and conditions couldn’t have been more ideal. We had an excellent set in the Spring. Warm, but not too hot weather in August ripened the fruit. And then, starting the first of September we had cool weather that prolonged hang time and developed flavors. As a result, we are seeing rich, complex flavors at lower sugar levels. This is the latest we have harvested other than in 2010. That year we had cold weather and it rained several times before we picked the Pinot at the end of October and the Syrah early in November. That was a difficult year. By comparison, 2018 has been just about perfect. The 2018 promises to be exciting!